ENSINGER Penn Fibre is the nation’s leading manufacturer of engineering and high performance polymers in extruded plastic sheets. Extruded from .031” to .250” thick and up to 48” wide, most stock plastic sheets ship in one to two days. 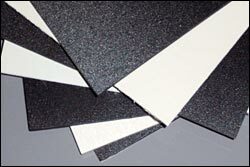 Plastic sheet in custom thicknesses, widths, and lengths - supplied to your specifications in generally 4-8 weeks. Plastic sheet .031” to .250” thick and 24” wide are stock. Wide (4 ft.) plastic sheet .062” to .250” MAXIMUM thickness – stocked in tandard length of 96”. Incremental widths and lengths are quoted on a custom order basis. Minimum production quantities may be required. Stock engineering polymer sheets include Natural, MDS and Black Nylon plastic sheet; Natural and Black Acetal copolymer plastic sheet; and Delrin homopolymer plastic sheet. Limited thickness options are stocked in Delrin AF® (PTFE) sheets, polyvinylidene fluoride (PVDF) sheets, polysulfone sheets, modified polypenenlene oxide (Noryl ® PPO) sheets, Pennite® glass reinforced nylon sheets, Pennite® long glass fiber Polypropylene sheets, Fortron® glass reinforced polyphenylene sulfide (PPS) sheets , Ultem ® Polyetherimide (PEI) sheets, and poly ether ether keytone (PEEK) sheets. Many non-standard plastic sheets, including electrostatically dissipative (ESD) acetal sheets, custom colored plastic sheets, supertough nylon sheet, and other custom sheets are supplied on a custom minimum order basis, with lead times averaging from four to eight weeks ARO. Pennite® 4512 Thermoformable Nylon sheet, Thermoformable PPS sheet, Thermoformable Pennite glass reinforced polypropylene sheet are available - also on a custom order / minimum production quantity basis, with lead times average four to eight weeks ARO. Highest inventory availability in the Industry. Many orders ship in one to two days!